Kid-friendly and parent approved, Disney Consumer Products (DCP booth #783) will showcase its newest selection of "better for you" produce, lunch items, and snacks at the Produce Marketing Association’s (PMA) Fresh Summit Convention & Expo on October 18 - 20 in New Orleans, La. Sales of Disney-branded fruits and vegetables have tripled over the last two years, and more than 3.1 billion servings of Disney-themed fruits and vegetables have been served in the U.S. since 2006. Grocery retailers have expanded distribution of Disney-branded produce, and licensees continue to introduce new products featuring beloved characters from Mickey Mouse and Disney Princess to Monsters University and Marvel Super Heroes. Through innovative marketing campaigns and in-store experiences, families have been encouraged to choose more nutritious food options and live a more active lifestyle. For the first time, DCP’s PMA booth experience will feature artwork from Marvel and Star Wars, representing the entirety of The Walt Disney Company entertainment brands under one umbrella. · Marvel and Crunch Pak (Booth #403) team up for healthy snacking, with Marvel’s The Avengers and Spider-Man featured on custom designed packages of fresh sliced apples, shipping in spring 2014. · Monsters University-branded Flavorz by Crunch Pak (Booth #403) are apples infused with blue raspberry flavor for a shockingly refreshing taste. Disney Foodles offer delicious combinations of fruits, vegetables and other sides like dips, raisins, crackers or cheese in a fun, Mickey-shaped tray or Disney Princess carriage tray. Both are available at select grocers nationwide. · Disney-branded mangos by Freska (Booth #441) will launch beginning spring 2014. Four varieties of Mexican mangos including Tommy Atkins, Kents, Keitts and Ataulfos with packaging featuring a variety of Disney characters will be available at select grocers nationwide. · Disney Berry Quick Fresh Blueberry Snacks by Naturipe (Booth #1647) are pre‐portioned, single‐serve packs perfect for on‐the‐go snacks and lunches or a wholesome addition to everyday favorites such as oatmeal, yogurt, parfaits, cereals, salads and desserts. Packs feature classic Disney characters including Mickey Mouse, Donald Duck, and Goofy. 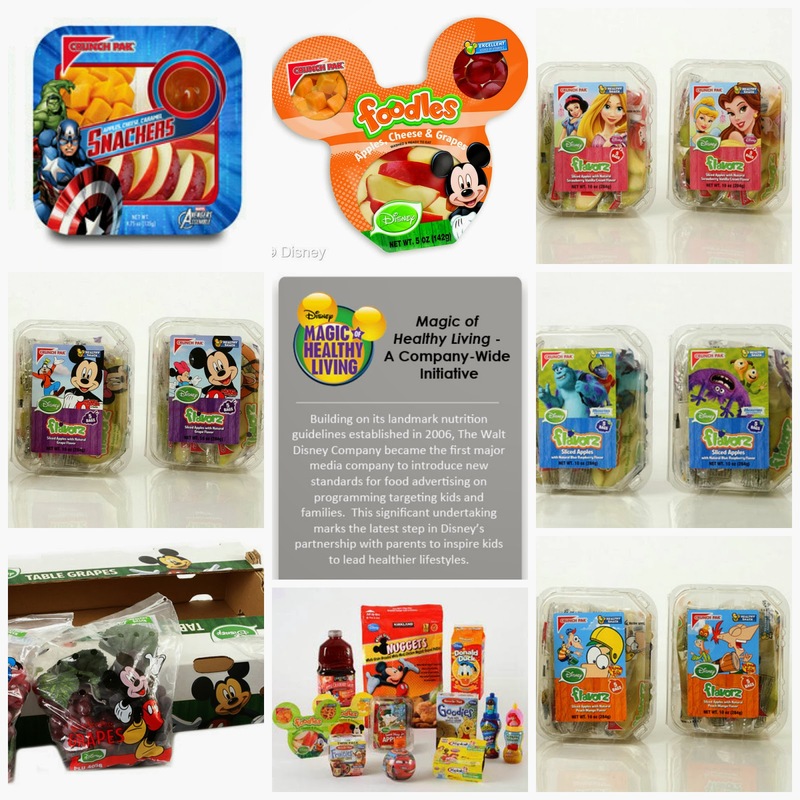 Disney-branded stone fruit and table grapes from SGS make healthy eating fun! The Disney peaches, plums and nectarines are yummy and nutritious, and Mickey Mouse- and-Donald Duck-themed clams of red and green grapes are an instant go-to snack. Disney-branded bagged apples and cherries by Chelan Fresh (Booth #4157) are enough for the entire family to share and come in colorful packaging with information to educate children on how to live a healthier lifestyle. Disney-branded grapes by Dayka & Hackett are a tasty anytime treat with fun packaging featuring Mickey Mouse, Minnie Mouse, and more. This year, Disney is serving as the “Champion Sponsor” of the PMA Foundation 5K Race for Talent. More than 1000 participants will join the race and support PMA Foundation’s mission to sustain a vibrant global produce industry through initiatives that seek to recruit and retain top talent. At the finish, participants will be treated to Disney-branded produce. Disney Magic of Healthy Living partners with parents to inspire kids and families to lead healthier lifestyles. Through engaging content, useful tools and unique experiences, this company-wide initiative helps parents by making nutritious eating and physical activity simple and fun. As a part of this initiative, Disney Consumer Products has transformed the landscape of Disney-licensed food offerings. DCP maintains a balanced portfolio with 85 percent of all of its U.S. licensed products meeting the company's nutrition guidelines and only 15 percent reserved for special occasion treats. Thanks so much to Disney Consumer Products for providing all this wonder Foodie news today. For more information on Disney Magic of Healthy Living, please visit www.thewaltdisneycompany.com/mohl or at www.Twitter.com/CitizenDisney. What are your favorite healthy snacks in the parks? We always go for the carrot sticks, grapes and bananas. They are so delicious and nutritious to snack on while waiting for the next show or attraction.